We did a survey on sheds for storage amongst woodland owners and although the sample is small, the results were nevertheless interesting . We had responses for 27 woods; 14 had no shed and 13 woods already had a shed in use. The woods were mostly between 5 and 14 acres in area. The prime use for a shed is storage. All of the respondents quoted forestry tools and materials; all but three quoted camping kit, tables, chairs, kettles, etc; nine talked of things to help children with woodland activities; one owner stored green woodworking tools. Apart from storage, a shed is seen as useful for shelter from the weather by 60% of owners. Twelve respondents gave the collection of rainwater from the roof of the shed for washing as a benefit. ii. Facilitating study of bio-diversity; sculpting in wood; as a hide for bird watching, for tree seed propagation and keeping reference literature on trees and wildlife. More than half of owners said that a shed can reduce track damage, by lightening the laden weight of their car and by making it possible to leave the car at the roadside, particularly so when tracks are muddy. Most owners had found, or could find, somewhere in their woods where a shed would be invisible from any road or public footpath. Everyone with a shed, or wanting one, favoured careful siting to minimise any environmental impact, and to deter intruders. 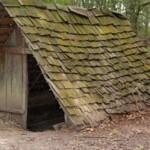 To support sheds all owners used or plan to use rows of bricks, large stones, oak or chestnut logs, or sleepers, rather than laying concrete foundations (so that no permanent mark is left on the landscape). 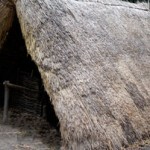 One respondent suggested a design resembling an iron age round house. 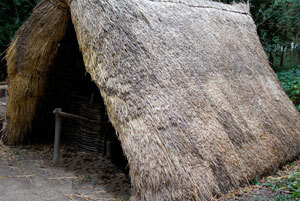 A wooden shed, either prefabricated or, as several people suggested, made from timber from the wood itself, was favoured. Some want or have a steel container, painted green; though one believed that anything built in a wood should be built as much as possible from produce of their own wood. 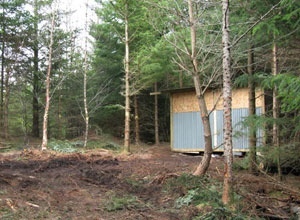 As to size of shed: about half of the existing ones are quite small (6 ft by 4 ft) and about half are around 8 ft by 18 ft. The size most wanted for woods without sheds is 10 ft by 12 ft. I love woodland and reading all your messages has really got me thinking. So I’m wondering just how easy is it to be able to buy your on woodland and how easy is it to maintain. Are there any tips you could give me re looking at a site, additional costs to be aware of etc. 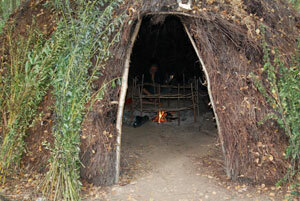 Can you for example use the land to put up tents for a youth group in order to explore, learn and maintain the land? I planted a fruit orchard of 60 plus trees as an experiment to see which varieties would do best. I then got the Council Planners down and asked if I could build a shed, because I wanted to increase the Orchard by another 500 trees using miniature and half standard stock in our 10 acre greenbelt plot. They said it should be OK as long as no one could see it. I needed the shed for storage of tools, tree stakes and all the usual paraphernalia. I even told neighbours what I was doing. No probs they said. Meanwhile, the same Planning people have OK`d the building of 28 houses on Grade A Greenbelt just down the road from us. They really are a law unto themselves. Tread with caution and don`t trust anything they say. In response to Sue’s comment, you are only liable to trespassers if they can show that any injuries they may sustain are as a direct result of your negligence. Woodland is woodland with it’s own inherent dangers for example trees, exposed roots etc., if somebody decides to climb a tree and falls then you cannot be held responsible as you have no control over their actions, if however a dangerous tree which you were AWARE of falls on somebody then if you were AWARE of the danger then you may be liable. Best advice is keep the woodland well maintained in a manner which YOU consider safe to wander around in for you, your family and friends, that way you should be OK. ( If in doubt ask the local forestry commission officer to visit your woodland with a view to developing a management plan and during his/her visit mention your concerns regarding public safety and he/she should be more than competent to advise ) This service is usually free. As for insurance, it is all well and good to insure against public liability but ALL of the companies I have had dealings with in the past have clauses which require the woodland to be maintained to an acceptably safe level before any claim will be honoured, and the chances of a well maintained safe woodland EVER being subject to a successful negligence claim are virtually zero. General guidelines are that you should inspect your woodland twice a year for potentially dangerous trees or dead branches etc. and routinely after heavy storms, provided that you do this or at least claim to have done this ( within reason ) then you should be fine. Putting up fences invites the inquisitive and spending thousands on secure fencing makes you feel like a prisoner on your own land, I personally have no fences anymore but when my family and I are camping on the land we put up polite notices stating our presence and people generally steer clear, when we’re not there then if folk want to wander through what I consider to be a beautiful piece of english countryside then they are more than welcome and I hope that they give it the respect that it commands. Let’s face it, we’ve all wandered through woodland at some point that doesn’t belong to us. Owning a woodland can be very challenging but equally very rewarding given time and perseverance. Always wise to take out insurance of some kind or other. Im about to hand over hard cash for my lovely bit of woodland but having read all this legal stuff Im terrified. Is this all going to be more trouble than its worth? The vandals have already had a field day and smashed down fencing to get motor bikes in. Yet it seems we are liable if they hurt themselves! Im really worried now. You probably have already done this, but the most important move when keeping stock is to get a CPH number for your holding. This takes you into a totally new ball game and may well lead to the different rights pertaining to an agricultural holding. However I feel that we are on thin ice with the shed we built, but with 11 pigs running round now removing the bracken we needed to put siomething up to store feed/medicines/tools etc as we are in the process of restoring and actively managing the wood. Where do you think we stand? My experience is that planners will do everything possible to enforce what you cant do. Maybe that is their job. They certainly WON’T tell you what you can do. Imho to find out what you CAN do you have to research ALL the statute and byelaws from forestry peeps through to local planning etc. AND THEN TELL THEM WHAT YOU ARE DOING. NOT ASK. jmho. But do it with complete courtesy and friendship. Iam interested in enjoying my own woodland..in particular gasification of wood to generate electricity and heat. Rain water collection. Edible mushroom cultivation. Digesters. All forestry related. NOT a business. Anybody doing or planning similar activity..PLEASE contact me for a chat. I have some fab ideas you may like. [email protected]. As well as the 28 days kip I think that can be extended for example for harvesting fruit etc..ie chestnuts ? Berries ? Lets keep sharing info eh ? for our container. It is sited in our wood which is within Green Belt and is in a conservation area. From our experience I would suggest always be up front with the local Authority. I have looked at various options but was worried about vandalism etc. I’ve put a 30 ft container in my wood with an extra set of doors welded on so that it is like a tube when open, I also had to have skids welded on to get it in to the wood and in behind each door about 1 meter in I’ve put patio doors and insulated and marine ply’d the interior. Along with a stove and some corregated to collect water off the roof I’ve also added some solar panels to power lighting and a radio. Total cost – doing it all myself has been about 5k, probably the best 5k I’ve ever spent as its now very comfortable, classed as a caravan. I can stay there 28 days a year plus store store anything valuble. The container people advised me to have lock boxes welded on for security and so far theres no sign its been touched. I talked to th eplanners before hand and they said it was a good idea as being very secure it discourages any attempts to force a way in. We have to be aware that the land is essentialy open to all, and so it should be, there will always be those who want to vandalise things. Its a difficult balance as a lot of people think that ‘their’ wood is some sort of fantasy space where they can act out whatever hobbitesque ideas come to mind, in reality land is used by lots of other people ranging from resposible walkers to poachers. A little forsight can mitigate against providing an opportunity for others to trash your wood. as far as i know your caravan will be fine as long as it is used for tea/coffee making facilities toilet etc as i have recently had a visit about my motorhome and my local authorities have replied saying this is fine as long as it is not lived in. Although as far as my research into this, you are allowed 28 days per calendar year on your land overnight. Would it be possible to put a touring caravan in your wood land? I was wondering wether a Yurt is classed as a permanent structure. I’d love to put a few yurts on my property and rent them out for a few weeks of the year. Am I likely to run foul of planning? The whole planning issue is precarious because it is usually better to keep your head down. Once you start asking, you can get a resounding’no’…I’m checking out information on this web site at the moment because we’ve had hassle from the parish council about putting in an access. The planners told me we didn’t need permission because there was already a gate there and the road is unclassified but one or two people have chosen to get hackles up about it even though we clearly require it! You try poking timber through an overgrown gate down onto a narrow road. Unfortunately, wooden structures are not good enough. 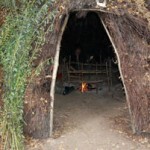 Vandals burnt down our open sidedshelter and a yurt we had up. I think I would go for a shipping container by preference now. Although this could be seen as a challenge by some? We’ve just had some direct experience of this. It is true, you can’t just put up a shed – you need to get the OK. If you are clearly running a forestry enterprise (even a small scale not for profit one), then under the The Town and Country Planning (General Permitted Development) laws the planners more or less have to OK it as long as you can show good reason/need for it. You need to submit a ‘Prior Notification‘ and you can expect them to visit the site, and they will produce a written appraisal of your proposals. However, you may be allowed to build something quite substantial for storage of equipment. You need to have an outline plan drawn and complete a form, with a cheque for £55. Your request will go on the local authority web site and local people / anyone can comment on it. They will ask you to confirm that it is for forestry use only i.e. not any sort of a dwelling/overnight accomodation (you will still need to pitch a tent outside it, no matter how cosy you make it!). 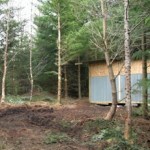 As is said elsewhere on this site – it must look like a shed and not a log cabin! Planners are obsessed about property developers buying woodland acreage cheaply then building private houses and holiday homes on it. You might get a shock at how seriously they investigate any such request. If you are caught taking a nap in your shed overnight – expect a visit from an enforcement officer! Just thought I’d provide a note of caution regarding structures within anybodies woodland. You may run the risk of needing to be a planning expert and planning can be a minefield. I would strongly recommend a precautionary approach, as dependant on size of structure, its location within the woodland and its use, planning permission may be required. If your land falls withn Article 1 (6) land; National Park, The Broads & certain parishes within the UK, further restrictions apply to permitted development. Before construction takes place or plans/details are sent in to a Local Planning Authority I would advise speaking to a planning officer to get an idea of what is permitted. Could save alot of time and heartache in the long run. 8’x 20′ on the edge of the clearing, which holds our tools and other implements, hopefully more securely. There will be plenty of time & materials to camouflage it later. 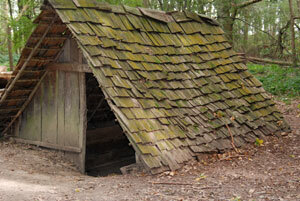 What do woodland owners do about sheds for storage ? Payment for what . . ?